Image caption Bethan Colebourn's family said she "brought joy to people's lives"
A mother who murdered her three-year-old daughter following the break-up of her marriage has been jailed for life. Claire Colebourn, 36, drowned Bethan in a bath at their family home in Fordingbridge, Hampshire, in 2017. Colebourn tried to take her own life after killing her daughter but was revived by paramedics. She was found guilty of murder on Friday. She showed no emotion as the judge at Winchester Crown Court told her she must serve at least 18 years. 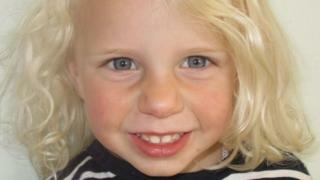 Mrs Justice Johannah Cutts said Bethan was "a beautiful little girl who was full of life. She had everything to live for". The judge said Colebourn should have asked for help after her life became an "emotional rollercoaster" when her marriage broke down and her husband left the family home. Despite being in a "highly emotional state" there was "no evidence of mental illness" and there was "no excuse" for the killing, the judge said. "You were her mother, you were responsible for her care and her wellbeing. "You wanted to deny your husband the chance to bring up Bethan. Bethan was entitled to and deserved a life," the judge added. In a statement released through the police, Michael Colebourn said: "There are no words to describe the past 18 months. The one thing in my life that gave me purpose has gone. "My beautiful daughter has been taken from me in such a cold and callous manner at the very hands of the one other person that should have protected her and kept her safe. "Throughout the criminal trial, I, and all those that loved Bethan have had to endure the heartbreak of listening to her last moments. "I desperately miss being a daddy - we would have such great times together; Bethan's laugh was infectious and her energy was endless. There is not a second in the day that goes by that I am not thinking about her." Former biology teacher Colebourn was found guilty of murder by unanimous verdict on Friday after the 11-strong jury deliberated for two hours. She did not react as the verdict was delivered. Bethan was found lying in bed at her home in Whitsbury Road by her grandmother on 19 October 2017. Paramedics were unable to revive her. Prosecutors said Colebourn had an "unfounded" belief that her husband Michael, a company chief executive, was having an affair. In a Facebook post Colebourn wrote: "Michael walked out on his family on 7 September and we haven't seen him since. "He has been having an affair with his financial director at work. Everything has been pre-planned. "They are aiming to conquer the business and set up a new life together." Colebourn set an alarm for 03:00 and then took Bethan to the bathroom where she ran a bath and drowned her. She had told police: "She woke up... she put her hands on my cheeks, told me she loved me and said 'I don't want a bath, mummy, I don't want a bath'." She then attempted to take own life by repeatedly injecting herself with insulin. During the trial, it was heard Colebourn had searched for websites about suicide and drowning. Karim Khalil QC, defending, said Colebourn appeared to have a personality disorder but this was disputed by experts. Colebourn has spent nearly a year in custody which will be deducted from the minimum term before she faces the parole board which will determine whether she is ever released.